Sinsheim - The headlines wrote themselves as Bayer 04 Leverkusen returned to winning ways courtesy of a 1-0 victory over TSG 1899 Hoffenheim with Stefan Kießling scoring the only goal of the game at the same end as his infamous ‘Phantom’ goal. 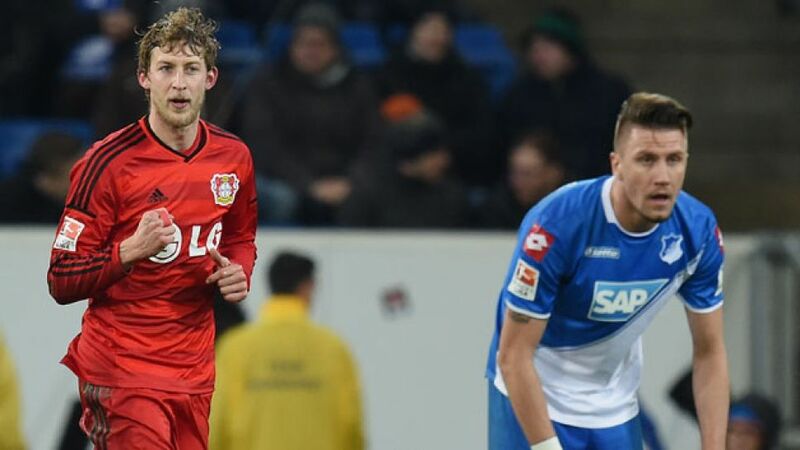 The intense end-to-end encounter looked destined to end in a stalemate despite numerous chances being created by both sides, yet Kießling was the man in the right moment at the right time in the 79th minute to ensure Bayer 04 took all three points back to Leverkusen. Considering their preferred style of play, it came as no surprise that both teams were quick out of the traps as proceedings immediately settled into a high-octane rhythm with Hoffenheim carving out the first clear-cut chances less than ten minutes in. Roberto Firmino capitalised on Ömer Toprak’s horror pass, but failed to get the better of Bernd Leno one-on-one and the Leverkusen No1 was called upon less than a minute later, ensuring Kevin Volland’s dipping drive from range didn’t break the deadlock. Not to be outdone with the chances coming thick and fast, Leverkusen almost took the lead themselves as Oliver Baumann produced a strong save to deny Kießling, who then dragged a second shot wide of the target just past the 20-minute mark. Goalscoring opportunities dried up approaching half time as mistakes began creeping in as a result of the physical pressing approach of both sides, though Leno had to be alert to Sebastian Rudy’s late effort to keep the scores level at the break. Neither side showed signs of taking their foot off the pedal during the early exchanges in the second half, as Baumann was called upon to deny Gonzalo Castro from the tightest of angles just minutes after the restart. Hoffenheim responded in kind as the subject of goal-line technology came to the fore when Toprak cleared Adam Szalai’s header off the line with replays suggesting the officials were right not to heed the hosts’ pleas for a goal to be awarded. Clearly set-up to hit their opponents in transition, Markus Gisdol’s charges were struggling to find the final pass to break the offside trap as the assistant referee’s flag and mistimed challenges prevented the encounter from maintaining any kind of flow, as Kießling and Tarik Elyounoussi exchanged unsuccessful efforts either side of the 70th minute. Replacing Hakan Calhanoglu with just over ten minutes remaining was a risky move from Leverkusen head coach Roger Schmidt, but it was a gamble which paid off as the playmaker’s replacement Julian Brandt darted to the by-line to square the ball to Kießling, who made no mistake from five yards. Hoffenheim threw men forward in an attempt to rescue a point, but aside from a tame Szalai effort, failed to truly threaten as Bayer 04 closed the gap on second-placed VfL Wolfsburg.